Attractive option – Epoxy floors offer a visually attractive option. They are bright and smooth. They are often featured at vehicle dealership showrooms. Easy to maintain – Epoxy floors can usually be maintained through simple routine cleaning, such as sweeping and spot cleaning. The floors also repel water, oil, cleansers and other substances, so they usually do not get messy. Affordability – Epoxy floors are often a much more affordable option for homeowners. It can be installed directly over concrete floors, so there is no need to rip up the old floor to use it. Durability – When properly maintained and installed, epoxy floors can last for many years. It also enhances the durability of the flooring material underneath it, such as concrete. It can last for many years without peeling or cracking. Protective coating – Epoxy provides a protective coating to the concrete underneath it, blocking it from moisture, grease and stains. It also prevents cracks from forming. 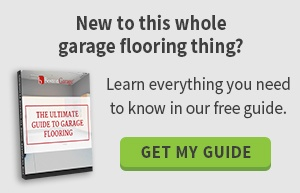 It is common for garage floors to have stains and cracks. Before applying epoxy, a professional technician will want to ensure that there are no existing cracks in the underlying concrete. If there are, he or she can take steps to repair the crack. A professional can clean the floor with a degreaser or general-purpose cleaner. Once the technician removes the oily residue, he or she can apply a cement-based patch product to fill any existing cracks. Epoxy cab also be used for crack injection and comes in a variety of consistencies, including ultra-thin to a paste-like consistency. These products can be used to address cracks of various widths. Wider cracks require a thicker material. Epoxy can be used for wide cracks and cracks that require structural repair. They may take several hours to cure. The technician can then apply an epoxy coating to level out depressions and leave an impervious surface behind. Know how to clean them – Avoid acid-based or soap-based cleaners, which can harm can leave behind a residue and make the floors more slippery. For minor spills, use paper towels or a soft cloth to wipe them up. For routine cleaning, use a soft bristle broom or dust mop. Use the right products for heavy cleaning – For more intensive cleaning, use a hard foam mop. Use mop water that consists of five ounces of ammonia per gallon of water. Clean stains – If your epoxy floors develop stains or rust, perform light scrubbing with a scrubbing pad and hot water. Avoid abrasive cleaning chemicals. You can also hose out your epoxy floor. Protect your floors – Even though epoxy garage flooring is very durable, take extra precautions to prevent damage to the coating’s surface. Place protective pads underneath motorcycle or bicycle kickstands. Place a piece of half-inch plywood under each jack stand when performing work on a vehicle. Place a welcome mat near each entry point of your garage so that it can pick up residual ice, rain or snow and prevent tracking onto your floors. Repair damage – If your epoxy floors sustain damage, contact our knowledgeable technicians for assistance. For more information on epoxy floors or to get a quote for your garage, contact us.